Yes, you read that right: the 2013 Chevy Malibu, which has been criticized for its supposed lack of rear-seat space, does have ample room in the second row. How do we know? Because we just conducted an informal experiment of sorts. Now, the back seat isn’t a palatial comfort lounge… but it serves its purpose, and serves it well. The critics got it right regarding the leg room. I was at the dealership today. I’m only 5 6″ but when I adjusted the drivers seat to my height, my legs hit when I got into the back. It feels so much smaller than my g6. The trunk is huge though. If I didn’t need the room for two large car seats, it might be an option but right now I’m hoping they discount the new impala. I don’t know if height is the only issue, I had trouble getting my big fat feet (size 11) in the back. It feels tight for legs/feet back there. When you get into the 2012 Fusion it is EFFORTLESS (we own one). The problem is real if you compare them side-to-side at an auto show. I think the ‘Boo is a BEAUTIFUL car, but Chevy screwed this issue up big-time. 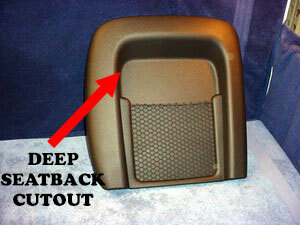 The “deep seat” won’t solve the “bigfoot” problem. Can’t believe they are going to “Impala-ize” the front styling, the car LOOKS awesome as it is; looks ‘grrreat in red. But for the other side Alex?? or if there’s anyway that you guys can demonstrate it without closing the driver side door? He wasn’t cramped… I checked after the fact, and do you see how far back he is?! good to hear!! So by that means when you sit in this car compare to the epsilon one vehicles like the Malibu Maxx or the G6 which do you think (or you feel) it has more legroom? However, its not as bad as some critics have made it out to be, which is the entire point of this exercise. It’s definitely not “unusable” or “terrible”. Also, the new Altima has less than the Bu. Alex, My leg hit the back of drivers seat. Once I was seated in the back seat, I had an inch or more of room. The angle of the front seat could have contributed to it but I could strap footballs to the front of my legs and still not touch in my g 6. It’s not as bad as the cruze but I’d expect more from a mid size sedan. For a little more money you can get into an equinox with plenty of space. I just don’t see this selling well without a large rebate. thats good enough proof for me in the video. I am Looking forward to full road test of the Malibu turbo in silver topaz metallic. I drive a Chevy Cruze. I’m 5’9″. My roommate is 6’4″. Whenever we go out with friends, we sit up front, and our two buddies sit in the back, about as tall as me, and even on drives to California (from AZ) or Vegas, everyone does fine. I am completely sure that the Malibu has PLENTY more room than the Cruze. Whoever it is that is complaining, you need to seriously get that stick out of your trunk. What do you really expect when you get inside of a car? The interior of a Cadillac Escalade. Get realistic. These comments suggest to me that rear legroom space is ‘relative’ to everyone’s context or expectation. For example, comparing the Malibu’s space to that of a Pontiac G6 or to what someone would expect for a vehicle in the family sedan segment. So ‘legroom’ is a relative term for the amount of space someone expects to have to get in or out of the vehicle; and during a longer trip as an occupant. Given that it’s relative to individual context or expectations, then the best testimonial is to go to a dealership (or auto show) and try it for yourself. Automotive journalists have tended to all comment on the lack of rear seat legroom in the Malibu. And seeing as they review a lot of cars and compare vehicles in the same segment, it suggests to me a ‘common opinion’ or experience. Is their criticism exaggerated? This video seems to suggest so. But if you compare the rear legroom in a Malibu to that of a Mustang you would probably conclude that there is enough space to play Tennis back there! But that’s not a comparison of cars in the same segment obviously. It’s all relative. I’m 5′ 8″ and wear a size 8 shoe. I’m considered ‘short’ for an off-the-rack suit. So I probably fit quite comfortably in the rear sear and have ample room in the footwell under the front seat. But a guy (or gal) of larger proportions behind a similar person in the front seat would probably find things snug. For the Family Sedan segment, it appears that automotive journalists have a relative expectation for more rear seat legroom. the previous gen Malibu (and G6, Aura) had a much longer wheelbase than the competition (and even some size cars), and limo-like rear seat legroom, as did the Malibu Maxx of the even previous version (the regular bu of that version had a shorter wheelbase). While nice for rear seat passengers, I personally thought these cars felt long and narrow when driving – changing it to slightly shorter and wider seemed appropriate for this size car. If you frequently travel long distances with tall people in back, you should probably be looking at the Impala for roominess in all dimensions. I think most of the complaints about the rear seat roominess come from the loss from the previous version, not necessarily the adequacy of the room in the new car, which overall is now more appropriately sized in the middle of the Cruze and Impala. A bigger problem in my book are the front seats, which seem flat and unsupportive. Hopefully they get some attention in the 2014 update as well. Alex, I appreciate you taking the time to post the video. You met your goal of demonstrating that the back seat legroom IS NOT as bad as some automotive journalists have suggested. It was a good demonstration. Thanks. Matt — the Malibu, to me, is the best-looking car in the segment as well. The five-spokes seen in this video are awesome and even though it wasn’t the star of the show, I spent a good 30 minutes around the new Malibu, even after having driven it. The Malibu also has the best driving dynamics in the segment, making it even more of a winner. Also, the Fusion tries way too hard. Alex, the roofline on the malibu felt more aggressive in the front so I reclined the seat a little more than normal to compensate. As I mentioned before this may have contributed to my leg touching. As you mentioned, some reports of the back seat being unusable are false but I know understand why this update isn’t being well received by so many critics. This is a family car where utility, safety, value, mileage, and reliability are the primary drivers for purchase not looks and handling. The camry is a perfect example of that. personally I hope chevy will again put more effort into making the best product and worry less about product overlap. Critics consider the Regal a “Sports Sedan” rather than a “Family Sedan” , so they cut it more slack on rear seat room, ala the Caddy ATS. i drove some malibus while working at a dealership, and intensly liked the car. i am 6’4″ and 180 slim. i did move the front seat forward a notch or two, and the back seat was adequate even when the front seat was fully back. still, i wonder how little metal and weight would be required to add 3 to 4 inches in length, all dedicated to back seat room. also, i doubt that any engineering would suffer for the front / rear weight distribution. i see it as a possible family car. I think the new Malibu is okay looking, but I think it will need alot more than just a front fascia change to make a difference. The rear end looks like it does not flow with the rest of the car. If they could slim down the height of the trunk, I think that would look more sleek. If the seats can get carved out more in the back, it might help. For what it is worth, the car with the absolute most comfortable seats for me was the new Camry. Even if the car is stellar otherwise but the seats are not very comfortable, the driving experience will suffer. Put the best possible seats in the “new” new Malibu and it will sell. BTW, the Camry has sold over 30,000 cars in Jan. 2013 alone. I guess all those people feel comfortable driving them. Malibu is about half that. We’ll see if that changes over time… I sure hope it does. That said, the Malibu drives better, looks better, has better in-cabin technology, and is safer. Not sure about the seats, as I haven’t spent long enough with a Camry to tell one way or the other. However, I think that with the right tweaks here and there, the Bu has its best chance yet to outsell the Camry in the long run. What do you think about the ford fusion Alex?? Alex,I agree that for average size passengers, the Malibu’s rear seat room is not a critical problem. But, the truth is , Honda, Fusion , Camry and Hyundai/Kia are better packaged. You have to take Front legroom into consideration as well as rear. So, when the competition has 2-3″+ more front legroom as well as 1-2″ in the rear, if the front seat is not all the way back, that adds the additional room to the rear seats. Then you have a definate advantage for the competition. GM could learn from Honda how to get the most room in a similar sized vehicle. I noticed most of the competition has has a 109-110″ wheelbase. GM may have to add a couple of inches of wheelbase to the next Malibu to finally stifle the critics of its legroom.But, I do think GM will be able to tweak the current Malibu’s weak spots enough to make it a more serious competitor. All the competition has laid their cards on the table, so GM knows the improvements it has to make on the Malibu to be at the top of its group.